It can be a bit of a shock returning to fish in the UK after tropical seas. Anyway, last weekend I managed to drag myself out of bed for a quick thrash on the rocks of the Purbeck coast. Ben and Richard were with me and when we arrived at the cliff top the omens were not good. Despite a friendly forecast there was a bit of a cool breeze and we could see (and hear) a big swell breaking against the rocks. Tricky! Well there were three of us and it didn't look dangerous, just wet and unpleasant, so down we went. Despite reliable reports a few days earlier of lots of mackerel and a few decent bass the first half-hour was totally blank. We flicked flies and plugs out into the gloom but there was no sign of life. 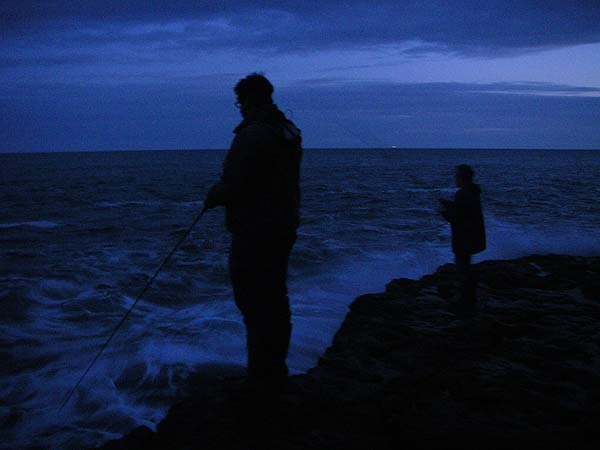 As the light improved I suggested that Rich might try a spoon in the hope of catching me a suitable mackerel for bait. Sure enough, ten minutes later, his rod bent and he landed just the fish I was after. That was it. Despite further flogging of the water we had no more touches, even my live mackerel was ignored (actually there was probably nothing down there to ignore it). When the light improved we could see, 500 metres offshore, dozens of gannets skimming the sea and entering the water at the shallowest of angles. Clearly there were large numbers of fish right on the surface out there. For a brief (very brief) spell a shoal of small fish came in close, breaking the surface and making the sea look as if it was raining heavily. 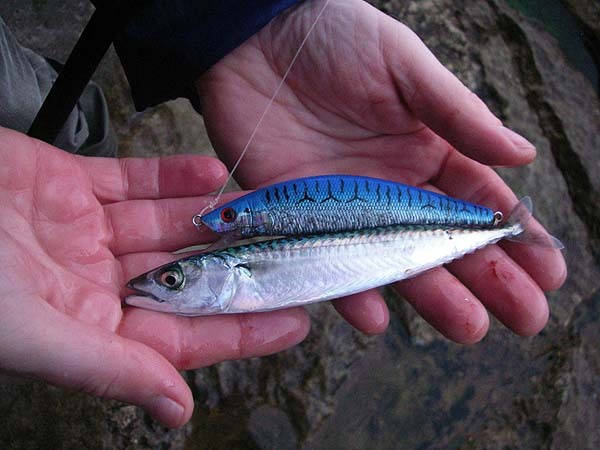 At this point Richard's plug produced a tiny scad and this was followed almost at once by an equally tiny mackerel - neither was hooked in the mouth. Clearly these young fish were what the gannets were after. All in all it was a poor session but it seems likely that the little fish were driven right to the surface by some sort of predatory attackers - probably bass. Perhaps next time we go they'll be close in. Well, I live in hopes.